Except for a brief foray to Manchester, our quest to trace the history of the Christian faith in twenty-five objects, twenty-five historical relics that survive for us to see and even touch today, has kept us in Italy, in the heart of the ancient Roman Empire. But today we depart from Italy and move west until we have touched down in Dublin, Ireland. In the heart of Dublin City is Trinity College and housed in its library we find Ireland’s national treasure: The Book of Kells. 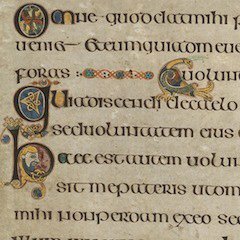 The Book of Kells is a lavish illuminated manuscript that contains the four gospels in Latin along with a collection of texts and tables. Its 340 folios are of the finest vellum and its text is an expert example of the script known as insular majuscule. But what most stands out are the extravagant illustrations with their brilliant colors and elaborate ornamentation. The Book of Kells is not only a Bible, but also a stunning work of art. Some have called it an Irish equivalent to the Sistine Chapel and this is by no means an outrageous comparison. While the Book of Kells survives largely intact, its origins and history are difficult to trace. Most historians believe that it was produced in the scriptorium of a monastery on the Isle of Iona off the west coast of Scotland, and that it was prepared in honor of St. Colum Cille, or St. Columba. It dates from around 800 A.D. or perhaps slightly earlier. In 806, after a Viking raid that left 68 of the island’s residents dead, the Columban monks fled to the Abbey of Kells in Ireland’s County Meath. Whether the book was produced at Iona or Kells or partially at each is a matter of much debate. In 899 the Abbey was sacked and pillaged. In 918 the Danes plundered Kells, and laid the church level with the ground. Rebuilt, it was again spoiled and pillaged by the Danes in 946. Three years later, Godfrey, son of Sitric, plundered the Abbey. In 967 the town and Abbey were pillaged by the King of Leinster’s son, supported by the Danes; but the allied forces were assailed and defeated by Domnald O’Neill, King of Ireland. Only a year later the Abbey and town were despoiled by a united force of Danes and Leinster people; while in 996 the Danes of Dublin made yet another pillaging raid on both the town and Abbey. There is more. Not long after that final raid the book was stolen and before it could be recovered it suffered significant water damage. The gold and jewel-encrusted cover had been torn off and as the cover was removed, so too were some of its pages. Neither the cover nor these missing pages have ever been recovered. In modern times it has been poorly rebound and the leaves harshly cropped. And still The Book of Kells has survived largely intact and still stunning in its beauty. Of the 680 pages in the book, only 2 of them lack any kind of ornamentation. Most pages have multiple character illuminations and several are almost entirely covered in decoration and illustration. These illuminations feature up to ten different colors, necessitating the use of imported dyes that were both rare and expensive. The artistry is so fine that some details can only be appreciated under magnification. Of all the illuminated manuscripts produced in medieval Europe and surviving to our day, this is the finest. It is a true treasure. The Book of Kells is important as a Bible, an adaptation of Jerome’s Vulgate text. It is important as a stunning example of medieval art. But for our purposes it is equally important as a demonstration of the spread and preservation of the Christian faith. Rome had at one time been the center of Christianity, but as the Roman church became corrupt, bound to the traditions of men and obsessed with earthly power, God preserved his Word and his people in other lands. The Book of Kells reminds us that though the ancient church was at first a local movement, God had intended that Christianity would be a global faith. Before his ascension Jesus Christ had told his disciples that they were to be his witnesses in Jerusalem, and Judea and Samaria, and to the ends of the earth. They were to begin were they were, but to deliberately widen their evangelistic efforts until they had spanned the globe. As the faith was established and as it matured, Christians took their faith to the distant corners of the Roman Empire and the distant corners of the earth. With the faith firmly established in the British Isles, it would not be long before it spread to the Far East and to the New World. God had decreed that there would be Christians all over the world not only to proselytize the Christian faith, but also to preserve and protect it. We see as well that though the Medieval period was not a time when the Christian faith consistently thrived, the Lord still preserved his people and his witness. He, and they, patiently awaited a spark that would ignite the faith with new force. This year some 500,000 people will visit Trinity College and when they do so, they will see two of the four volumes of the Book of Kells. One will be opened to display a major illustration while the other will display two pages of text. Thankfully, we do not need to travel to Dublin to get a glimpse of its beauty. Rather, we can appreciate it through the high-resolution digital reproductions available online or through an iPad app.